One big change for future solutions is who's the new boss - and clearly not the same as the old IT boss. Tech savvy business leaders frustrated with the rate & pace of IT to meet their needs are taking development into their own departments. Data scientists and engineers now are sitting at the table with decision makers who are expecting the use of big data analytics to have immediate insights & impact. Last millennium tools like BA workbenches or IDEs don't meet the expectations of fostering business team collaborations like web applications do today - and their tolerance is low with regards to geeky explanations. Even the notion of an application seems outdated as business units see their business contexts continually changing. This talk will focus the shifting and emerging landscape that most businesses find them selves navigating in the data world. And today's successful businesses are capitalizing on insightful data as a distinct corporate advantage. Sign up now to hear how you can get your business ahead in today's data-intensive world. Rod Smith is an IBM fellow and Vice President of the IBM Emerging Internet Technologies or- ganization, where he leads a group of highly technical innovators who are developing solutions to help organizations realize the value of big data. His early advocacy in the industry has played an important role in the adoption of technologies such as J2EE, Linux, Web services, XML, rich Internet applications, various wireless standards, big data, and social data analytics. Rod has authored numerous invention patents and disclosures, and is the recipient of several prestigious awards, including the TJ Watson Design Excellence Award. He is also a long time member of the IBM Academy of Technology. 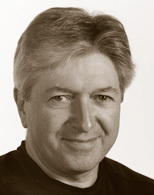 Rod is a Computer Science graduate of Western Michigan University, and holds a M.A. and B.A. in Economics with a concentration in Math from Western Michigan University.